We're all one happy family this weekend. Todd, Kristen, and Mr. Owen came into town and we're camping out at Grammy and Grandpa's house. 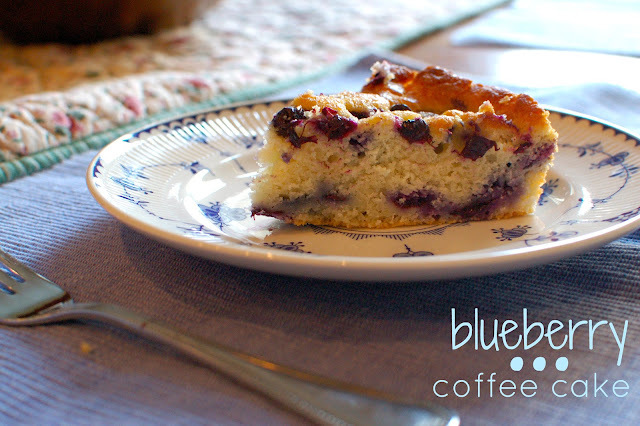 Knowing I wasn't going to be up for making pancakes in the morning, as much as I love them, I opted to make this blueberry coffee cake last night. It's a recipe that I found when sifting through a stack of papers. This time it was a copy which means my Mom gave it to me awhile ago with the unspoken words, "you should make this..."
The recipe hails from Cooking Light but you'd never know it. The buttermilk and layers of blueberries throughout make it a nice and substantial and perfect with a hot cup of black coffee. I made this last night and it tasted delicious this morning. 1. Preheat the oven to 350 then combine the flour, baking powder, soda, and salt in a bowl with a whisk. 2. Place the sugar and butter in a mixer and blend for about 2 minutes. Now add in the vanilla then the eggs and beat well. Now add in the flour mixture and buttermilk alternately, beginning and ending with the flour mixture. 3. Using a 9 inch round cake pan that's been sprayed with cooking spray, place half the batter in the pan then top with 1 cup of blueberries. Spoon over the remaining batter, top with remaining blueberries, and sprinkle the turbinado sugar on top. 4. Bake at 350 for 50 minutes or until wooden pick comes out clean. Cool in the pan for 10 minutes then remove from pan. Enjoy with coffee. You'll be glad you did. This looks SO good. I have to pin it and do it sometime. Nice! I hope you end up liking it!